Home » Blog » Windows » Speed up your PC with Readyboost on Windows! Do you have an older laptop or desktop running Windows? if so then you would understand the frustration of lag and other delays with your programs or general system performance. 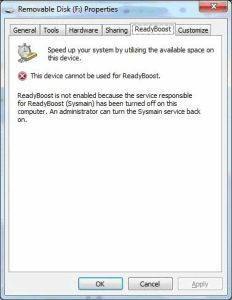 If your PC is running Windows Vista or higher then a feature called ReadyBoost may be able to help solve your problem, the way this works is by utilizing storage devices such as a USB drive or Sdcard and use a set portion of space as if it were RAM. Of course this is not as fast as physical RAM but will definitely help out with performance issues, we recommend a fairly fast Sdcard or micro USB to get this done as they are generally faster and will be more beneficial to your PC. First off you going to want to make sure that you have a fairly fast USB or Sdcard, from my experience an Sdcard is significantly faster than a traditional USB drive but your experience may vary depending on read/write speeds. Next insert the card or plug in the USB into your PC, it is advised to dedicate an sdcard for this purpose as Readyboost will take a good portion of space for swap storage leaving little room for data files. Once you have a USB or Sdcard ready navigate to “My Computer” and right click on the drive in question, from here choose properties then go to the “Readyboost” tab. Now choose “dedicate this device to Readyboost and move the slider to the amount needed and press apply. You should try to always keep this plugged in for it to work, if you do unplug it and use the drive across other computers then you may need to repeat the process above for your PC to use it as RAM. Now you can enjoy a slightly faster experience and reduce some of that lag. If your computer has over 4GB of RAM then this will most likely do nothing although if your machine has 1-3GB of RAM then this may provide a much needed boost. If your PC is fairly modern and contains an SSD then Windows will disable Readyboost and will not require it to be used. You receive an error saying that the device is not supported for Readyboost: This is usually common for older USB drives or if you try to use an external hard drive, this error occurs when your storage medium lacks the available performance. You receive an error stating that “sysmain service is not enabled: If this is the case press the and hold the Windows button + R on your keyboard to open the “run prompt” from here type “services.msc” without quotes and press enter. Here you should see a list if system services. Scroll down and look for one called superfetch and right click it and choose properties, make sure it is set to started and automatic then restart your computer and try again. Great information. Lucky me I discovered your web site by accident (stumbleupon). I just want to say I’m all new to blogging and seriously liked your web-site. More than likely I’m want to bookmark your website . You certainly come with terrific well written articles. Thanks a bunch for revealing your website.